So these three dashing chaps represent my first troops for the 'Witchfinder General' rule set that has caught my imagination of late. 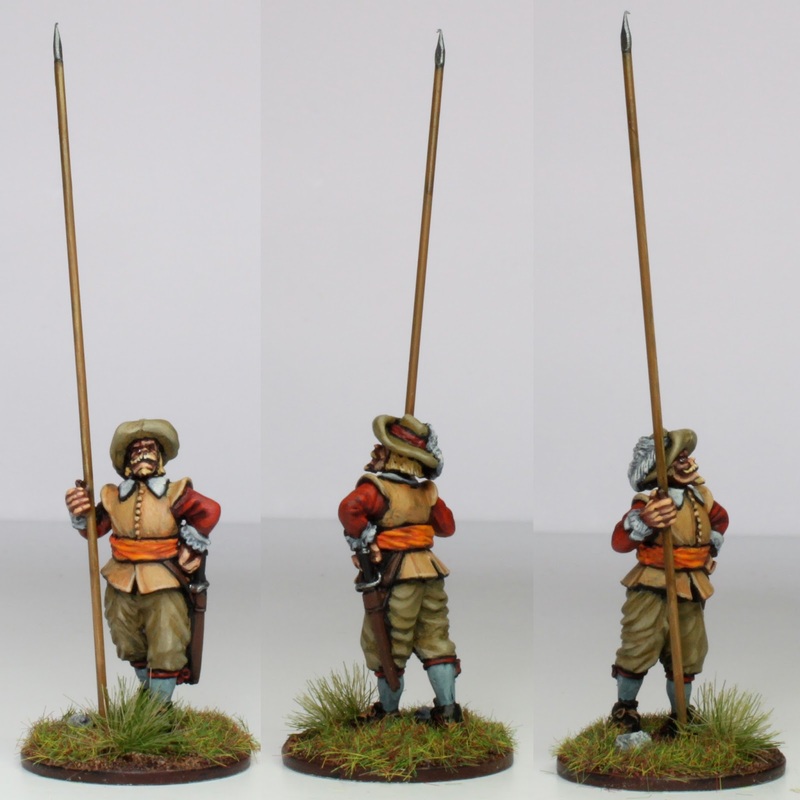 My first foray into the realms of English Civil War miniatures were as a direct result of an incredibly generous donation to the lead pile by that good friend of mine the 'Provost Marshal'. I believe that they are 'Redoubt Enterprises' miniatures and are the usual sturdy, strong cast that I have come to expect from them. Perhaps not the most useful of poses, but perfect as guards protecting us from the many denizens of the night that would seek out our mortal soul. 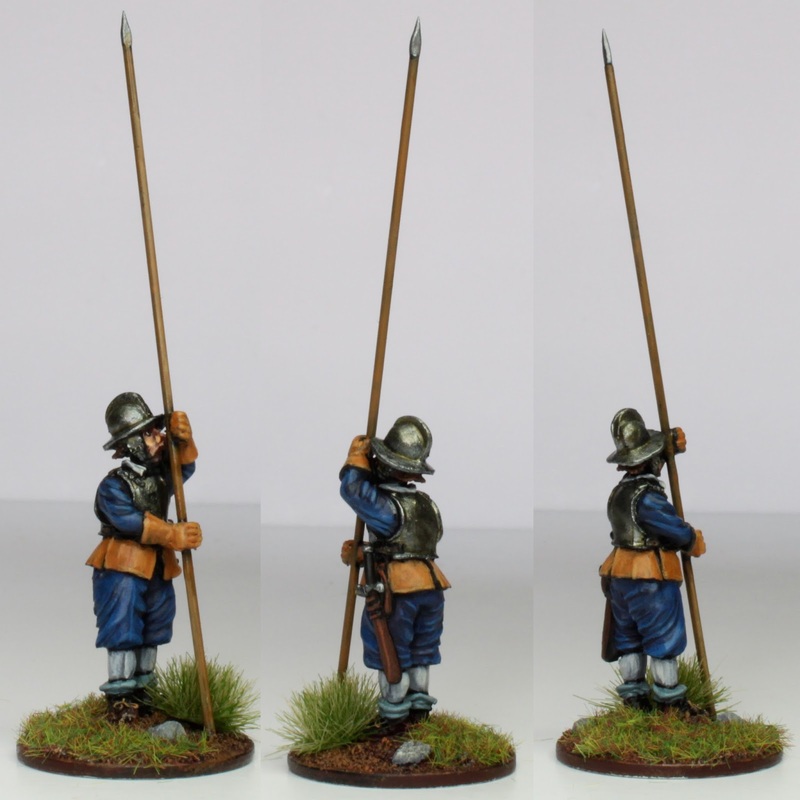 As the more regular readers of this humble weblog will know, I am not the most consistent of hobbyists, particularly when it comes to focusing on one subject for any length of time; it is for this reason that producing massed ranks of infantry or cavalry will always be beyond me. As a result we have three very different characters on show rather than a uniformed approach. If I understand the rules correctly then 'Common Folk', of which Pikemen are included, have some knowledge of the art and skills of warfare; they may prove to be veterans and have known life as a soldier - now banded together to rid the land of the vile abominations. As usual, I have started with the wrong troop types, needing instead to be mustering Clubmen, Ghouls and Barguests to get the first encounter up and running. What I have learnt, however, is that metal pikes are very sharp and should be treated with caution and respect at all times! Lovely painting, you've really hit the leather and buff colors! Thank you a bit of an unknown when I started, but fortunately I've kept some notes as I think I may need those colours again soon. Splendid! ECW is one of those periods I keep going back to. I have a nagging worry that I may be the same; will anything get finished? Always great work and paint Michael . That is incredibly generous of you Rodger, thank you. Excellent work as always Michael. That fellow in blue (blew?) looks reminds me of Secundus' (Iron Mitten) uniform which he was wearing at Campaign 2013. Thank you Tamsin, and now you mention it, I remember reading a post about that very thing - I wonder if that is where my subconscious dragged the palette from? Excellent work on these. Totally believe they are ECW period figures. Thank you Clint - the introduction of ghouls, witches and werewolves might change you opinion though! Another new period for you! Very nice work too. Very nice work Michael, your use of colour is as ever impressive. Cracking job once again Michael, loving the moustached gentleman. He is a bit of a dandy that one and thank you. Thank you Ian and yes the bloody do! Very distinctive looking figures and enhanced by another quality paintjob. Thank you so much Matt, I have to confess that I'm rather fond of the Redoubt chunky sculpts. Thank you Dean. I haven't reallt got my head around the rules as yet, just plodding along with the miniatures - it does look like fun though. Lovely painting! It's not my period but they certainly look nice. Just wait to the ghouls and undead arrive! Thank you so much Andrew. Thank you Phil, I was pleased with how that came out too. Your choice of colours is excellent. They go so well together. Did you put careful thought into them or does it come naturally to you? Thank you. Colours are always fun for me, but I will try to find some that carry through into each miniature. The buff and leather are obvious here, but the sock colours are the same also, it just helps to tie them together a bit more. In essence, I just grab a colour, offer it up to another and then work out the respective shade and highlights. Most excellent Michael. You can certainly use those lads for handling things you wouldn't touch with a 10'pole. I am sure there are many of the Warlord ECW line that can be used for Witchfinder General as well. Thank you Terry, I've picked up some Warlord Games bits to supplement what I have. They look lovely on their web site, but I have been disappointed when I get them in front of me. Poor casting and scale are my issues at the moment, but will review again when I get some paint on them. Especially if the pike goes under the nail, dashing work Michael. Oh how very true and thank you Francis. Very nice , good colour choices. Thank you Dave, more by luck than judgement. That is very generous of you Jason, thank you. Lovely work, they do look like dandies! I bet the long pikes are useful for picking a witch right off her broom. Now I hadn't thought about that, but that makes perfect sense! Great stuff, Michael. Looking forward to the ghouls and other things that go bump in the night. They are on their way, but I'm making slow progress at the moment. Lovely work mate. You've got the buff coats spot on. Thank you Millsy, all a bit of a guess at the moment. Once again excellent work, Sir Michael ! Thank you so much Stefan. 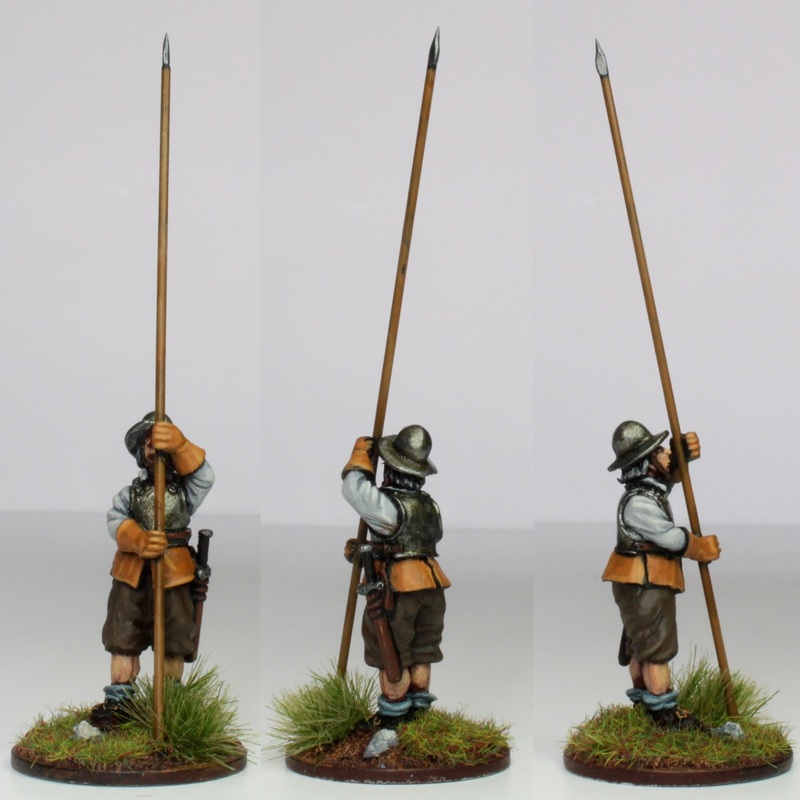 Bothing worse than putting your any onto to a table and find it impaled by a pike unit !. These three look very good but as you say fairly useless in a skirmish. Thank you, really sharp those pikes, I may have to issue a health warning before the go on the board! Very nice paint work indeed ! would be nice to heare your thougts about the rules 'Witchfinder General', you might already have posted a review that i missed? No real feedback to report yet Michael. Still working my way through the rules, but I do need to say that Eric Barnes who wrote them has been incredibly supportive and willing to answer all my questions and queries. Very nice painting indeed Michael! Too kind Christopher, thank you. lovely job mister - looking forward to seeing more of these as the roll off your production line. Thank you, but progress seems to have slowed again as real life tacks hold. These are figures of a period I really like! Great brushwork on them Michael!